A Weegie in the East Neuk of Fife. Let’s talk Stay-cations. As we all know the student life can be a skint one. This means we have to be a little more creative and thrifty with our extra-curricular activities and holidays are no exception. With 1 year left on my PhD, my holidays have had a make-do-and-mend theme to them. This is fine because if you are gonna Stay-cation, Scotland is one helluva place to do it. With gorgeous white sandy beaches, mountains, hills, glens, forests, machair, flora, fauna & a whole lot of wildlife in between, if we only had the weather, who needs a far flung holiday destination? Well I do, but this summer I settled for Fife where the sun was out in full force and the food could tempt any traveller. Here is my Weegie Foodie Tour in the East Neuk of Fife. 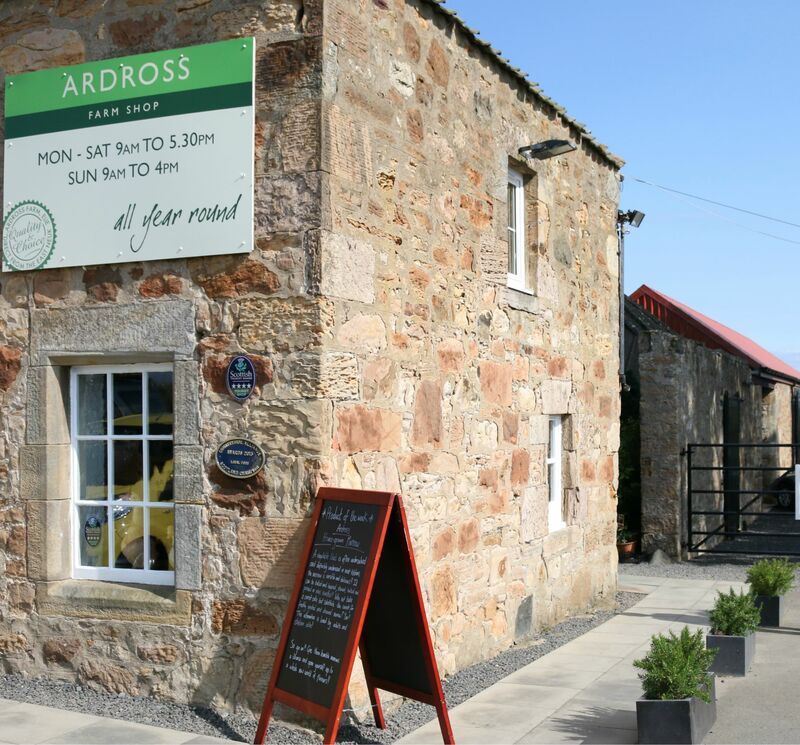 The first stop was the Ardross Farm Shop, heck it’s reason alone to come up to Fife, where I stocked up on the week’s shopping. The shop operates out of a beautifully renovated cart shed on the farm and prides itself on being a haven for food lovers. 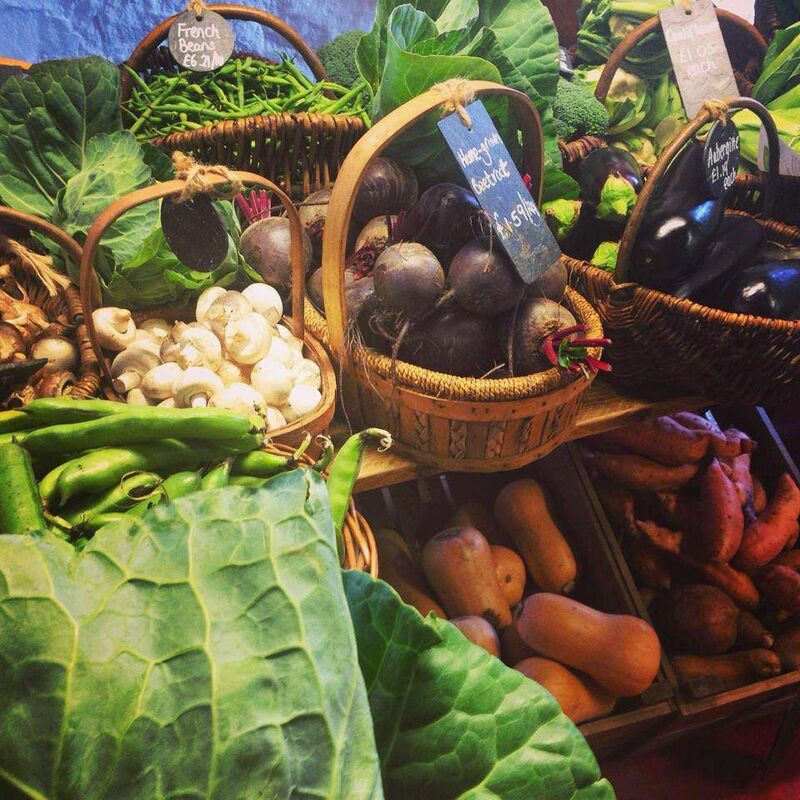 While the shop is relatively small it’s chock full of locally sourced produce mainly from small artisan suppliers. It’s no wonder I spend a small fortune each time I visit. However if you are on a budget you can still find some bargains, namely in the seasonal fruit & vegetables and free range eggs. A small selection of their fruit & veg. Image: Ardross Facebook. Your Piece oatcakes. Based in Fife, Your Piece produces oatcakes, shortbread, porridge bars and cereal using traditional methods. The oatcakes are chunky but not at all crumbly and quite frankly are the only vessel for eating cheese in this part of the world. Ochil Fudge Pantry. Fudge is fudge, we all love it, but what makes Ochil stand out is their variety of inspired flavours: Apple Crumble, Baileys, Butterscotch, Cherry Bakewell, Chilli Chocolate, Irn Bru and Rum n Raisin to name a few. Fear not, these folks deliver. Ardross Steak Pies. 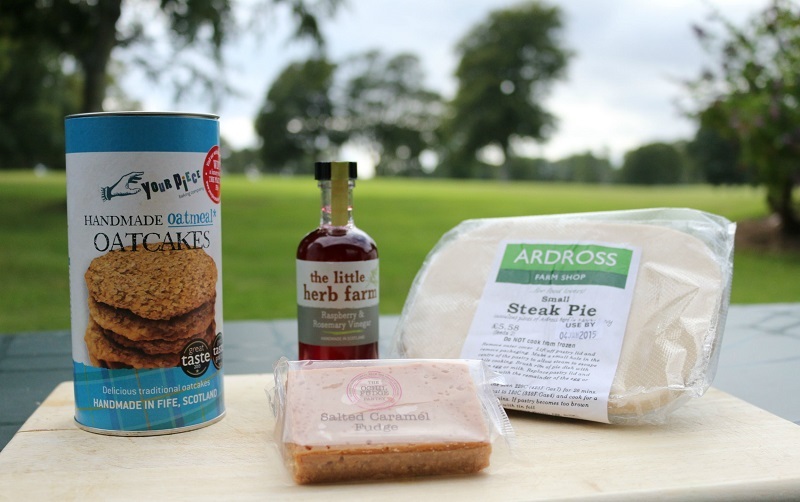 Ardross stock a fantastic selection of ready meals made in their own commercial kitchen and their steak pies are hands down the best I’ve ever tried. The pies have a light puff pastry lid & big tender chunks of steak in gravy. They come in 3 sizes to feed between 2-6 people. Stock up on several to stash away in the freezer for winter. With my fully stocked fridge on the first night I settled down to an Ardross tea of: Roast chicken with smoked garlic butter with the trimmings and a Strawberry Pavlova. 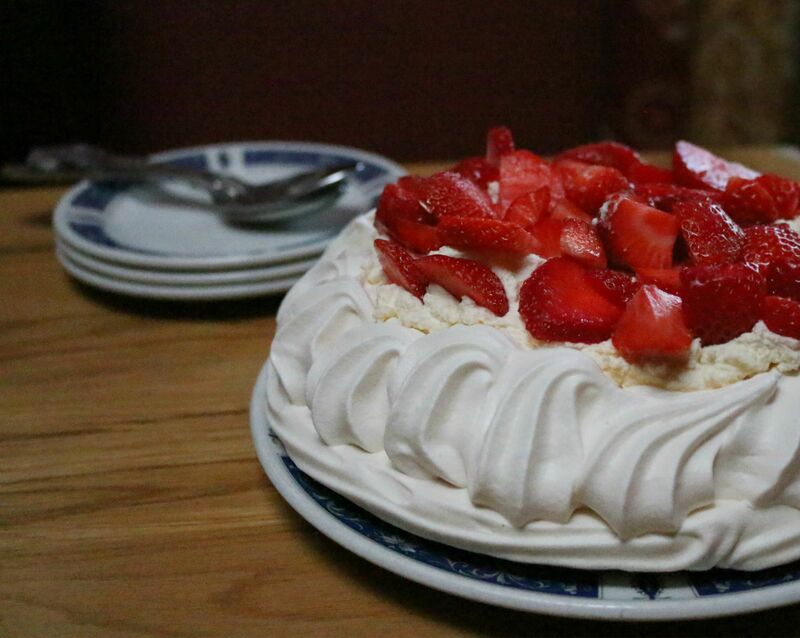 Thankfully I didn’t have to lug my beloved Kenwood all the way to Fife for the Pav (believe me I would have if need be) because Ardross stock Pavlova bases. All it needed was a thick layer of whipped cream & some Cassis drenched strawberries. I stumbled across Crail Pottery while exploring the Crail Festival on a drizzly afternoon. The pottery is a family business and I urge anyone to pop along for a look. Their courtyard & shop feels like a cross between a museum and the home of an eclectic hoarder. 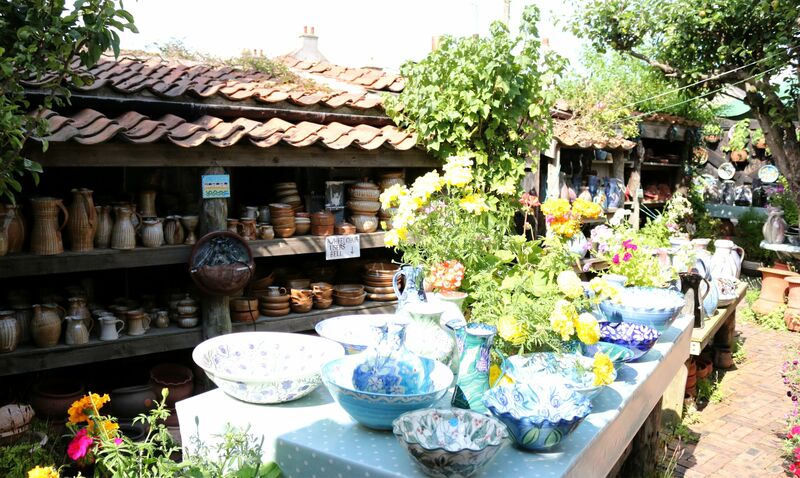 Every inch of the place has rows upon rows of beautiful handmade & hand painted pottery and no 2 pieces are the same. For such a small shop The Pittenweem Chocolate Company packs one helluva punch and as soon as you step in the door the smell is intoxicating. 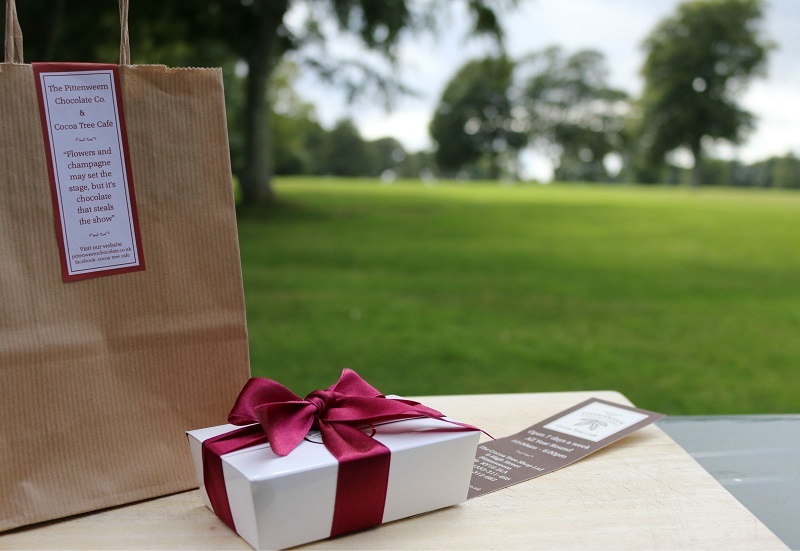 The Pittenweem Chocolate Company & Cocoa Tree Cafe is a family run business who produce their own artisan chocolate and source speciality chocolates from around the world. Now I didn’t get a chance to check out their cafe but their menu boasts a tempting selection of hot chocolates, cakes, crepes and waffles. Gentlemen, if you are trying to score brownie points with a lady friend, take them here & splash the cash. Who says you can’t gift yourself with pretty items? From chocolate to cheese. It was a no brainer to make this 2 mile trip outside Pittenweem. 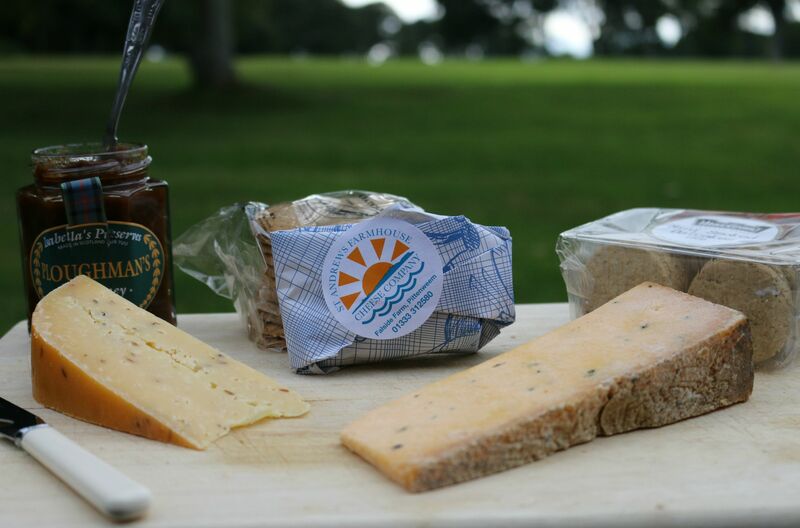 The St Andrews Farmhouse Cheese Company is another family business. 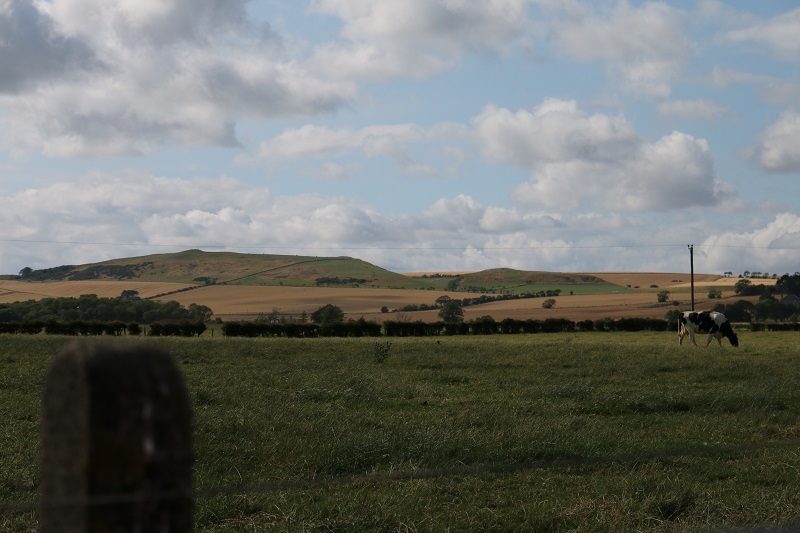 The cheese is made using unpasteurised milk which comes from their own cows fed on a rich grass & grain diet. You can purchase a range of cheeses & accompaniments in the shop and there are opportunities to watch the cheese being made as well. I purchased their famous Anster cheese which tastes like a creamy strong cheddar, a blue cheese and a hard mild cheese with cumin seeds which was divine. The only downside to this shop was the lack of locally sourced preserves. Cheese, oatcakes, chutney & cheese. What more does a girl need at lunchtime? Like I said in Weegie In Northern Ireland post, no trip to a coastal town is complete without the award winning Ice Cream and St Andrews is no exception. It may be the home of Golf and William & Kate’s romance but it is also the home of the lesser well known Jannetta’s Gelato Experience. Something I hear William himself enjoyed while studying there. 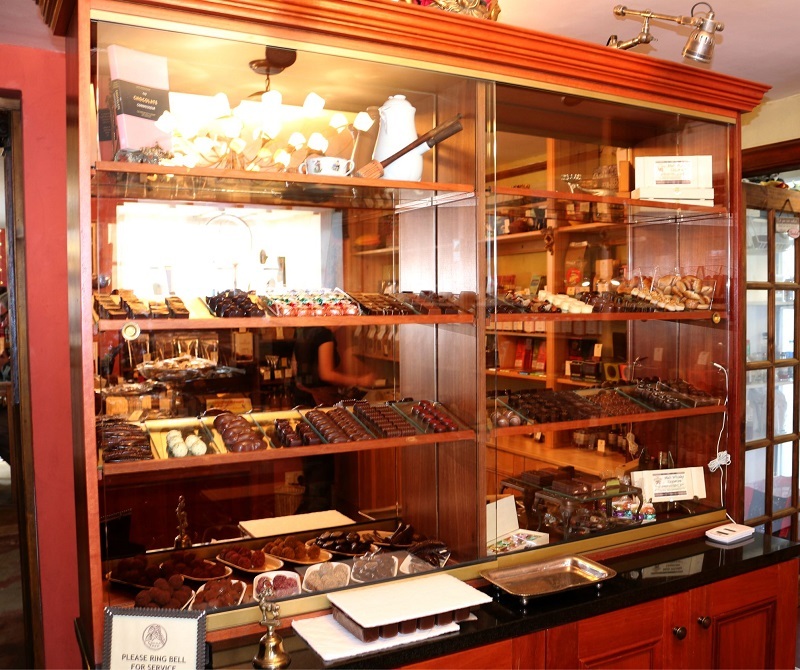 This family business has been operating in the same premises for 4 generations. 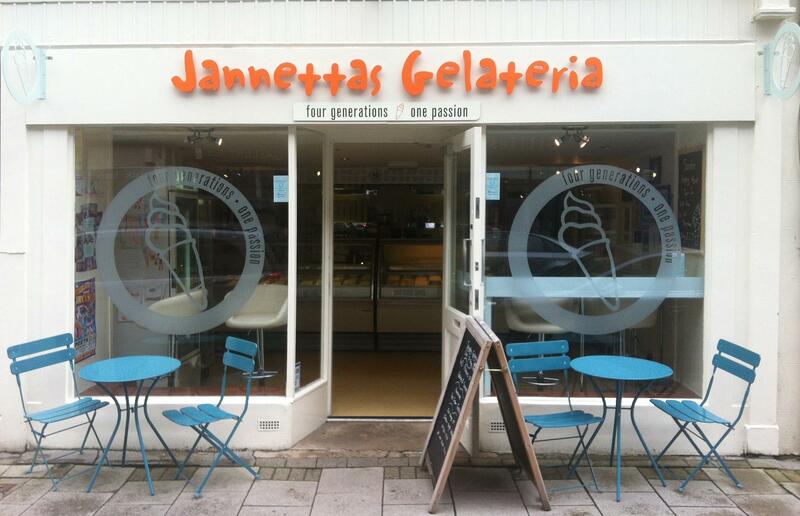 Jannetta’s stock over 100 flavours (every day) of gelato, sorbet & frozen yogurt which you can enjoy in a cone, a tub, a milkshake or a sundae. Alternatively, their Ice Cream Tricycle or Mini Marquee could be enough to tempt any couple to get married in the local area. I sampled a double scoop tub of Pineapple & Dark Cherry for around £3.50. Good enough for the Royals, good enough for me! 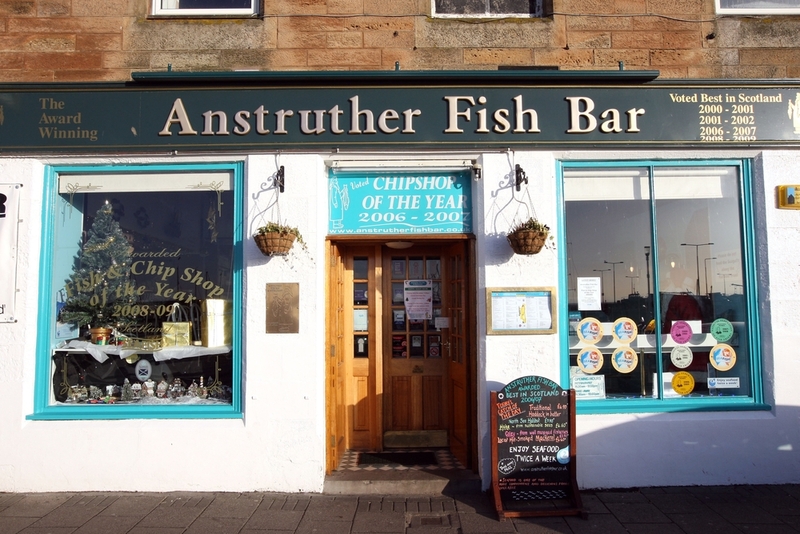 It goes without saying that no visit to the Neuk is complete without a visit to the award winning Anstruther Fish Bar for your tea. This family-owned business use sustainable produce and methods, and has garnered attention from everyone from the Royal family to Tom Hanks. Queuing is synonymous with the Anstruther Fish Bar and potentially part of the tourist attraction. The fact that even the locals are willing to queue when there are several other chippies on the same street, only serves to highlight its excellence. Just be mindful of what time you do visit. I queued for dinner around 5.30pm on a Sunday and waited 50 mins to be served. If you find yourself in the same scenario, wrap up warm & grab an ice cream to enjoy while waiting. Then eat outside on the pier. You can eat inside but tables are limited during peak hours. 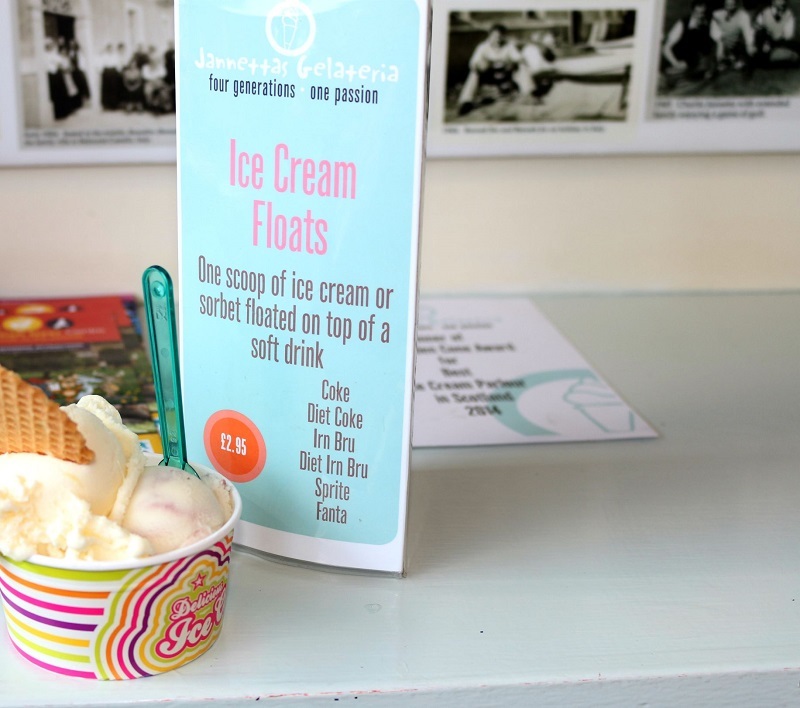 We went to St Andrews every summer for years as kids and I remember Janetta’s ice cream, I loved the good old mint choc chip! Why leave Scotland indeed, all looks and sounds fab. I have a bottle of that raspberry, mint and chilli vinegar in my cupboard, love it! It would be marvellous if you would come visit my wee shop in Guardbridge…Simpatica shares the shop with Yard-birds..and here you willl find an intriguing mix of unique furniture and home decor, gifts, hand crafted cards and tags and a whole lit more. Open 11-8 for summer hours and closed on Tuesdays. Find us next to the Guardbridge Inn and Rob Walkers Antique furniture showroom. Usually the St Andrews Farmhouse Cheese Company stock condiments from Trotters Independent – Mostardo is a favourite to go with cheese. They’re made by Byam Trotter in Fife. They often serve them with the salads in the cafe too. Hope you’ll come to Crail in mid-June some year when the Crail Food Festival is on – lots more fabulous local food for you to try! That’s good to know, thanks for keeping me right. I assumed they must stock local condiments. As I said, I must have arrived too late in the day & they were all sold out. Hope to see you on your next visit to the East Neuk, Simpatica is now located in Kingsbarns, next to the red post box. In addition to interesting items of vintage gifts, home decor and painted furniture..you will also be most welcome to have a refreshing cuppa and a variety of cakes, home made sandwiches and strawberry deserts. It’s a home away from home! If the weather perks up soon then I’m hoping to make a day trip through this summer, thanks for info, it sounds lovely!